In this article, I have explained how to fetch Office 365 groups and users Programmatically using Microsoft Graph API. 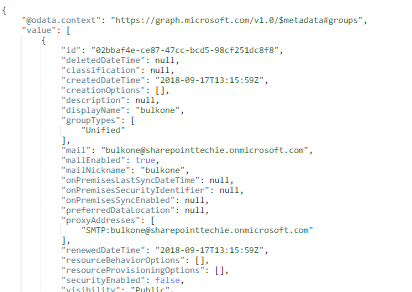 Let's get started to retrieve Office 365 Groups and Users from Office 365 using Microsoft Graph API. This endpoint helps you to retrieve all the office 365 groups from your tenant. It returns the ID, webUrl, displayName, CreateddateTime, mail, etc.. If you want to retrieve the particular office 365 group members use the following endpoint. It retrieves all the users inside the office 365 group with some properties like displayName, job title, mobile phone, userPrincipalName, etc. 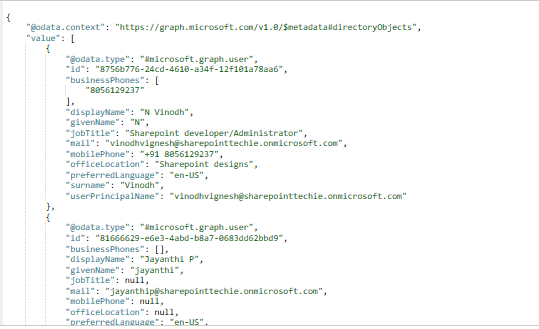 Let's programmatically fetch office 365 Groups and Extract users from office 365 groups using Microsoft Graph API. Fetch access token to authenticate your web application with Microsoft Graph API. You can iterate JSON data using for loop and display it in the web page. Now Create the function fetchOffice365UserFromGroup() to fetch all the users from the particular group from office 365 tenant. You can iterate JSON data using for loop and display it into your web page. So folks, now you learned how to retrieve office 365 groups and members programmatically using Microsoft Graph API with a simple jQuery.